This USSR military fur hat is an official issue USSR military hat used for dress and parade unifor during the winter months. It's very warm, cozy and durable, perfect for getting through the cold Siberian winds and snow storms. It is made of faux fur which consists of 80% wool and 20% polyester. This kind of fur has been specifically engineered in the Soviet Union for such winter army hats. It is known for withstanding the adverse weather. 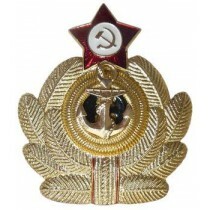 Each hat comes with a detachable Soviet soldier's badge (a $5 value). Should it be necessary, the badge easily comes off leaving no marks on the fur. They may be worn ear flaps up or down, which makes it perfect for skiing. Be sure to mention your size in the comments during checkout!